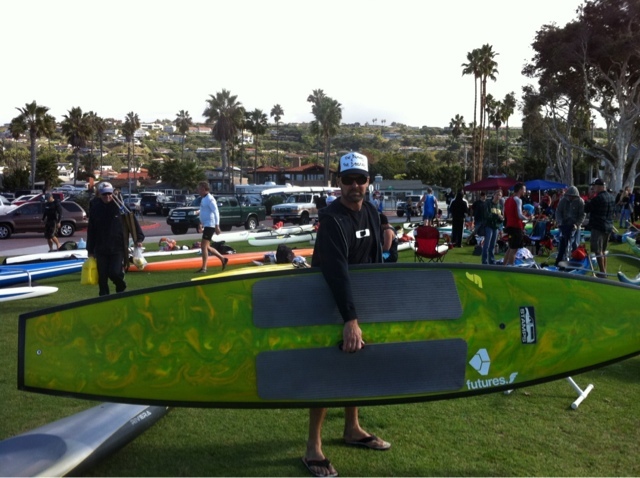 Just heard that my good buddy charged to a second place finish in open stock class stand up paddle board! Stoked for him. Kiwi told me that conditions at the race were the toughest of any race he's been in with lots of nasty cross chop and big, six foot open ocean swells. Kiwi borrowed my 30" wide Stamps Poison Arrow, paddling it for the very first time ever. According to Kiwi the board's stability was a huge plus in the mixed and stormy seas. Kiwi also went with one of Future Fins new race fins from the soon to be released 2012 line- these things are radical blending speed with weed free performance. Oh yeah, the two new Laird boards that were there got smoked! Good on ya, Kiwi! It's more the paddler, not so much the board!